It happens each spring and shouldn’t be a surprise. Kids grow up and spread their wings for the next adventure, leaving the nest and mama birdie. Graduation marks the closing of a chapter and the start of the next. It is a familiar storyline, and one we just wrote about last week. So why did it creep up on this mama birdie? This week my oldest son, Jackson, graduated from the 8th grade. Maybe this isn’t a huge ordeal, but to this mama, it was an emotional one. It seems like just yesterday, I was on bed rest for 8 weeks patiently awaiting (while trying to postpone) his arrival. We have been on a rollercoaster called “life” since before he was born, and continue to be – or get back in line for another turn at the amusement park. JV – as his cousin, Carter, nicknamed him – has been in the same school and part of the school family since preschool. He is now preparing for his next adventure – high school. Don’t get me wrong – he is ready. He is growing up to be a fine, respectable, young man. He has taught me much about being a mama birdie along the way. He is ready. I may not be, but that is how life goes. We sometimes aren’t ready for the big leap. We just have to have a little faith and jump. Do what you can to prepare – but know they will make some good and bad decisions along the way. Guide them to make better decisions in the future and commend them for the good decisions made. Good or bad experiences – learn and grow from them and love them. Congrats on closing this chapter and looking ahead to the next! Remember that cute little Glo Worm® toy that parents would buy for their kids so their children would feel safe at night from the soft glow it illuminated? I confess…I never bought one of those for my kids when they were little. Sorry kids. Well, I’ve been redeemed…my 30-year old daughter received her first “glow worm” on Sunday. 🙂 And if I do say so myself, he is the cutest little glow worm I’ve ever seen. Isn’t he one of the cutest glow worms you’ve ever seen? 🙂 Tyus decided to show up a few weeks early and has been in the NICU since Sunday. He is the biggest baby in there. He weighed in at 10 pounds 14 ounces. Big boy…and a fighter. Because my daughter is a Type I Diabetic, Tyus was getting lots of extra insulin while in the womb. Now that he is on his own and no longer getting his mommy’s insulin, his blood sugars needed to be stabilized. Tyus also had a little fluid in the lungs so needed some extra help with O2, and today his jaundice got a little bit worse; which has made him become that cute little glow worm in the picture above. He is making great gains each day, though, and for that we are grateful. Our hearts glow with love. God is good! Tyus is our new addition. A perfect gift for the upcoming New Year. He represents new life and isn’t that what we all need in the New Year…new life? I know I certainly do. A time to let go of the old, and start with brand spanking new. A new year…what a great opportunity for me. What a great opportunity for you. For all of us. I mess up EVERY. SINGLE. DAY. Some days way worse than others. But, with God’s endless love and grace and mercy and forgiveness, I get a new beginning each day. And so do you. Just like our new sweet little baby boy is the perfect gift for our family, God’s gifts of infinite love and mercy and grace and forgiveness are the perfect gifts for all of us. To Tyus…my prayers for you are to keep gaining strength so you can go home with your mommy and daddy real soon. Keep fighting, little buddy. Grandma will keep praying. To my daughter and son-in-law…my prayers for you are a peace of mind that passes all understanding, a massive faith, and an abundance of patience as Tyus continues to get stronger and heal. To our readers…my prayers for you are to be blessed with new life and new beginnings in 2016. May you find that soft glow of love too. Small request to ask…if you believe in the power of prayer, maybe throw one or two up for Tyus, will you? My heart will glow with thanks. 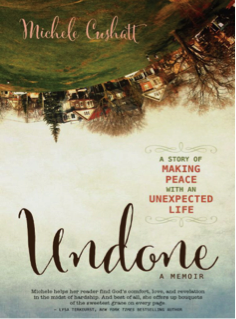 Clicked on those links, saw Michele’s new book Undone: The Story of Making Peace with an Unexpected Life, and had it downloaded to my Kindle app on my iPhone within minutes. Read on our drive home, read through basketball games and before bedtime, read this morning with a cup of coffee in my hand, then, finished the book after church. Just under 24 hours later, I put the iPad down, wiped away a few tears, and said a silent prayer for Michele. A page turner, indeed, @timdetellis! This book yanked on my heart strings. The story made me laugh; cry; hold my breath in fear (and I wasn’t the one scuba diving); miss my parents; think to myself ‘hey, I floss everyday too’; sing praises that I’ve had very few, if any, horrific challenges in life; share a few of the funny written words with my husband (‘holy two by four’); and thank Jesus over and over again for the life I’ve been given along with the unexpected gifts each day brings. Michele’s life memories are weaved together so beautifully with scripture. As I read, I would often stop and ponder moments from my own childhood or the years of raising my children. Memories of a life filled with adventure, small challenges, and lots of love. The way Michele pens her fears of the unknown put my heart in a vice-grip, and at times I couldn’t breathe. Uncharted territories of cancer, of an empty nest that disappeared in a blink, of raising a blended family and children with exceptionalities, of loss and grief, of losing a parent, and of almost losing herself. I would say the book is a love story. A love story between two authors…the author of the book, and The Author of our faith. A love story between a husband and his bride. A love story between a mom and all six of her children. Their love grew and grew. Deeper and stronger as they all navigated the journey together. And together is always better. Warning…if you choose to read this book it just might change you. Change your heart, change your thoughts, change your relationships, change your love of others, change your life! Go on…take the risk. I’m so grateful that Michele received that precious gift on Mother’s Day back in 2006. That “twenty-by-fifteen inch package, give or take, wrapped hastily in recycled wrapping paper.” A special shout out to Michele’s husband for understanding his wife’s prized gift…the gift of writing. Are you experiencing the winter blues? February is the month of LOVE filled with lots of red hearts and chocolate candy so let’s chase away the winter blues. If you are starting to climb the walls, we suggest that you take that literally. No, seriously, go climb some walls…do a little rock climbing that is. 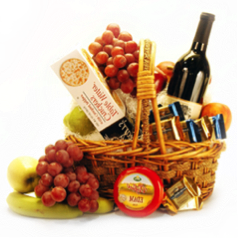 Picnic Date: Pick your favorite foods and beverage to pack into a picnic basket. Find a comfy blanket then throw it down on the floor in your pad. Unpack your food and beverage to enjoy some quiet time together…minus the ants. Don’t forget to savor some Valentine’s Day chocolate during your picnic together. Random Acts of Kindness Date: Who doesn’t enjoy making homemade Valentine’s Day cards? Especially us educators. Grab your scissors, glue, glitter, yarn, feathers, beads, and other stuff to create a few snazzy Valentine’s Day cards. Together, deliver them to a few of the elderly at a local nursing home. You will bless their day, and, your heart will be blessed even more. Fireplace Date: Find a fireplace then just sit and relax together. Grab a hot chocolate, visit quietly, and be mesmerized by the flames. It doesn’t get much better than that. Except if it’s a REAL fire, then you can make S’mores. Yum! Read Together: February is I Love to Read month after all! Being reading and literature specialists, we simply cannot resist this one – as cheesy as it might sound. Go for something that pulls on your heartstrings… remember Fly a Littler Higher? Or something that makes you laugh like Sh*t My Dad Says; we read that one on a flight once and the gentleman next to me asked if everything was okay. Sorry to disturb! We did laugh together. Wish Upon a Star: Whether at the planetarium or bundled up under the night sky, take time to look up together and make a wish. It is love’s season of hope after all. Be hopeful and optimistic together. The bills won’t pay themselves so you can’t wish work away, but you could wish and/or pray for the bright spot in life. Sweetheart Resolutions: Think of Valentine’s Day as your chance to start a fresh new year together – significant other, family members, and friends. Establish a list of what you want to continue/encourage with the start of this new year of love or what you want to do better. With the winter blahs and life’s stresses, it is easy to take for granted those we love and who love us back despite our faults. So, if you’re feeling cooped up, with your nerves about to fray; just change your attitude, there’s still time to save the day. Go on a winter date with friends or significant others because we are always better together. Happy Valentine’s Day to our teacher candidates and to all of our blog readers. Please share with us some ways that you beat the winter blues.